I mentioned earlier that Donald Rumsfeld said "At some point the Iraqis will get tired of getting killed." The Detroit Free Press reports that our military is killing more Iraqis than the insurgents, with many of those being civilians. Operations by U.S. and multinational forces and Iraqi police are killing twice as many Iraqis -- most of them civilians -- as attacks by insurgents are, according to statistics compiled by the Iraqi Ministry of Health. According to the ministry, which provided the Free Press with the figures Friday, the interim Iraqi government recorded 3,487 Iraqi deaths in 15 of the country's 18 provinces from April 5 -- when the ministry began compiling the data -- until Sept. 19. Of those, 328 were women and children. Another 13,720 Iraqis were injured, the ministry said. While most of the dead are believed to be civilians, the data include an unknown number of police and Iraqi national guardsmen. Many Iraqi deaths, especially of insurgents, are never reported, so the actual number of Iraqis killed in fighting could be higher. During the same period, 432 U.S. soldiers were killed. Iraqi officials said the statistics proved that U.S. air strikes targeting insurgents also were killing large numbers of civilians. Some of the officials say these casualties are undermining popular acceptance of the U.S.-backed interim government. The Health Ministry is the only organization that attempts to track deaths through government agencies. The U.S. military said it kept estimates, but refused to release them. A few days ago, I wrote about Sue Niederer, the mother of a young soldier killed in Iraq, who interrupted a speech by Laura Bush. The New York Times has a feature on her today. It's written by Chris Hedges, author of War Is a Force That Gives Us Meaning and who was booed off the stage when he tried to give an anti-war speech at a college graduation in May 2003. "They'll get tired of getting killed"
Jon Stewart showed clips of Defense Secretary Donald Rumsfeld on The Daily Show a few days ago to illustrate the fact that he seems to have really gone off the deep end. Im very encouraged about it. I think that the United States and the coalition countries, of course unlike, other countries we have no desire to stay there or to be there at all other than to help that country get on its feet. Were in the processing of doing that and theyre making good progress politically. Theyre making progress economically. The schools are open. The hospitals are open. They have a stock market functioning. They sent some teams to the Olympics. They have a symphony and at the same time, amidst all those good things that are happening, people are being killed. Iraqis are being killed, as they were yesterday and the day before. At some point the Iraqis will get tired of getting killed and well have enough of the Iraqi security forces that they can take over responsibility for governing that country and well be able to pare down the coalition security forces in the country. I see the DOD has trouble with "it's vs. its" as well. A woman wearing a T-shirt with the words "President Bush You Killed My Son" and a picture of a soldier killed in Iraq was detained after she interrupted Mrs. Bush's speech. Police escorted Sue Niederer of Hopewell out of the rally after she demanded to know why her son, Army 1st Lt. Seth Dvorin, 24, was killed in Iraq. Dvorin died in February while trying to disarm a bomb. Niederer was later charged with defiant trespass and released. As shouts of "Four More Years" subsided, Niederer, standing in the middle of the crowd of about 700, continued to shout about the killing of her son. Local police escorted her out of the event, handcuffed her and placed her in the back of a police van. The first lady continued speaking, and several people shouted back at Niederer. One woman yelled, "Your son chose to fight in that war." Here is an interview with Sue Niederer. She is a member of Military Families Speak Out. The mother of a soldier killed in Iraq was arrested after interrupting a speech by Laura Bush in Hamilton, N.J. Mrs. Bush appeared before a crowd of more than 700 people at the Colonial Fire Hall, trumpeting President Bush's efforts to fight terrorism and stimulate the economy with tax cuts. When she made reference to the war in Iraq, she was interrupted by a spectator, Sue Niederer, who shouted, "Why don't your children serve?'' Mr. Bush's supporters quickly surrounded Ms. Niederer, who wore a shirt bearing a photo of her son, Seth Dvorin, an Army lieutenant killed in Iraq in February, and the words "President Bush, You Killed My Son." As Bush supporters shouted "Four more years!" and Mrs. Bush resumed her speech, security guards led Ms. Niederer from the auditorium. Later, as Ms. Niederer stood near the doorway to the fire hall being interviewed by reporters, she refused a request to leave the premises and was arrested on charges of trespassing. 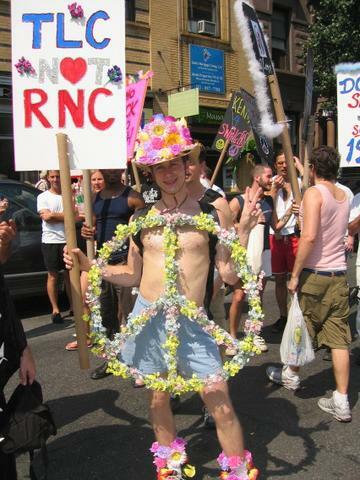 Common Dreams has an image of her protesting at a Colin Powell appearance in February. As I read about the conventions and the presidential campaign, I was struck by something. We have reached the point where the debate seems to be how to use the military to achieve our goals. Even Prussia at its most warlike understood that the military was only one part of effective statecraft. Are we really saying the only tool that this diverse, rich, and creative country has is war? Our corporations are capable of putting refrigerated Coke and Disney products into some pretty remote parts of the world. It's a shame that we can't put any ideas other than our ability to threaten people out there as well. Click on the image for the rest. This page is an archive of entries in the War category from September 2004.